Today Samsung Electronics has proven to be one of the most successful global brands to follow. Moreover, Samsung Supply Chain has demonstrated the operational excellence that leads them to the supply chain hall of fame. In this article, we will explain to you how they do it. "Samsung" in the Korean language means "3 stars" or "tri stars". At first, they had a strong root in the trading business. Later, they took the diversification strategy and entered the electronic industry by producing the black-and-white TV set. Anyway, the rise of Samsung started when Lee Kun-Hee succeeded his father as the second chairman of the company. During the 1990s, he noticed that many Japanese companies who were the leaders in the analog technology hesitated to adopt digital technology. Then he gradually created transformations that later change the face of the entire industry. At the macro level, Samsung tries to understand the behavior of consumers in a particular country by sending staffs to attend MBA programs at the local universities. These "Country Specialists" also establish a connection with many business leaders and potential business partners. At the micro level, they gather customer preferences and incorporate them into the product design through a method called "Quality Function Deployment". Based on "quality movement" in the electronics industry, Samsung believes they can improve the internal operations drastically using Six Sigma. Then they study various Six Sigma approaches from GE, Dupont, and Honeywell. Later, they create the methodology based on the GE approach called "DMAEV" (define, measure, analyze, enable and verify). Since the electronics market changes quickly, they need to be able to create a flexible production plan. So they implement APS system which brings remarkable success. In order to bring the internal departments closer, they use the system called "Voice of Business". What they do is to gather the internal requirements and establish an action plan based on a collective decision. The classic problem of many organizations in Asia is the seniority-based performance evaluation system. Samsung thinks they won't be able to attract the best and the brightest to help them grow if there is no performance-based system in place. Then they gradually integrate the merit-based system and allow high performers to have the fast track career path. To achieve the economy of scale, Samsung standardizes processes and parts and the majority of the components are produced in Korea. This also enables them to manage product quality more effectively due to the ease of control. They realize that risks are the fact of life. So they implement a very comprehensive risk management system and their risk mitigation strategies are low inventory level, flexible capacity, and redundant suppliers. The secret sauce behind Samsung's supply chain success is definitely "Best Practice Analysis". They study how other world's leading companies manage the business and choose to adopt these best practices gradually. - Khanna, T., Song, J., & Lee, K. (2011). The paradox of Samsung's rise. - Mo Yang, H., Seok Choi, B., Jin Park, H., Soo Suh, M., & Chae, B. (2007). 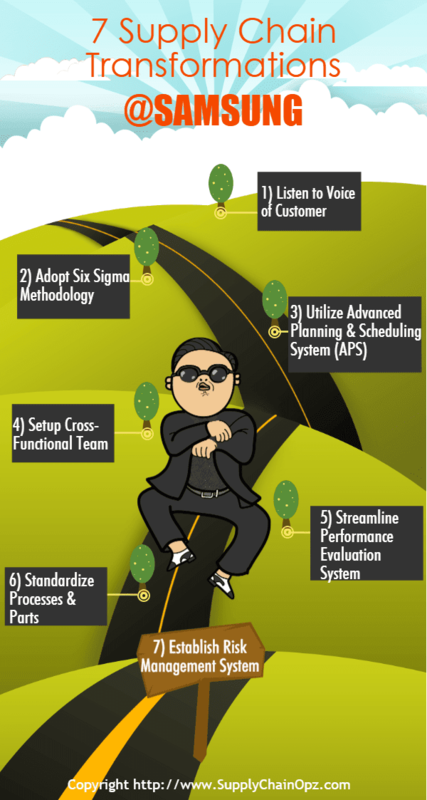 Supply chain management six sigma: a management innovation methodology at the Samsung Group. Supply Chain Management: An International Journal, 12(2), 88-95. - Sodhi, M. S., & Lee, S. (2007). An analysis of sources of risk in the consumer electronics industry. Journal of the Operational Research Society, 58(11), 1430-1439.